Facebook chief exec Mark Zuckerberg, speaking at the World Mobile Congress in Barcelona this week, declared that the mobile web is essential to Facebook’s future, and to connecting billions of people living in the developing world. The social media impresario cannot be accused of not putting his money where his mouth is, considering Facebook just last week paid the monumental sum of $19bn for WhatsApp, the mobile messaging smartphone app. In addition to Zuckerberg’s apparent quest to connect the developing world, where mobile internet users far outnumber those using fixed broadband connections, indications that younger consumers increasingly prefer messaging apps to Facebook are also behind this landmark acquisition. Only time will tell whether WhatsApp was worth the $19bn price tag, but here, using YouGov BrandIndex, we can test the initial reaction from consumers in several key markets. In Britain and America, consumers have certainly taken notice. The day before the deal was announced, on 19 February, just one in ten Americans were aware of WhatsApp, and today a quarter are. A third of British consumers knew about WhatsApp pre-acquisition, and now – just a week later – half the population are aware of it. 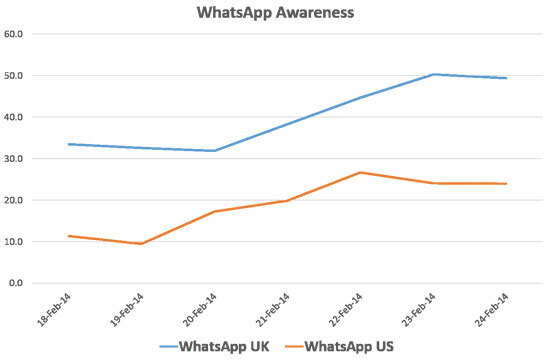 Awareness doesn’t necessarily translate into more users, however, and indeed there has not been much of an impact on the percentage of consumers who would consider using WhatsApp or Facebook – but it’s still early days. Currently, just 12 per cent of UK consumers say they would consider using WhatsApp, versus 53 per cent considering Facebook. In America the gulf between the two brands is even greater, with only four per cent of consumers considering WhatsApp, compared to 63 per cent for Facebook. 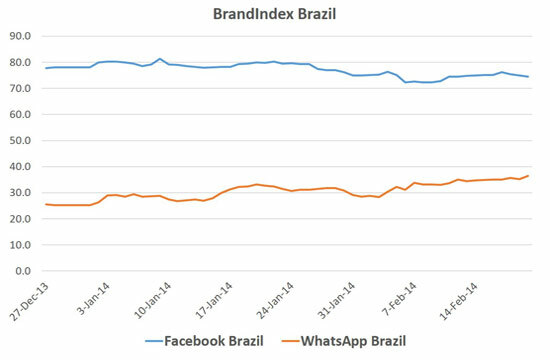 Of the markets we track, Brazil is the most enthusiastic about both brands, with more than a third considering getting WhatsApp (up from around a quarter at the beginning of the year) and three-quarters considering signing on to Facebook. Six in ten Brazilian households still lack internet access, but it is the largest mobile phone market in Latin America, making it just the kind of market where a big investment in mobile messaging could really pay off.